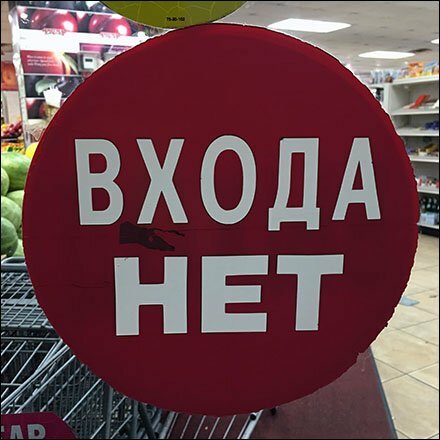 Here is a retailer that knows and understands his market and signs it with this Nyet Entry To Gourmanoff Russian Grocery. Gourmanoff Gourmet Grocery of Little Odessa, Brighton Beach, Brooklyn USA knows its Russian speaking customer base well-enough that little English is necessary signs. The manufacturer standardly advises “Automatic Door” but the Russian says not an entrance … so this is automatic exit function only. Don’t worry. I figured it out with only a minimum of gesturing and pointing from passing Russian immigrants that the entry door was to the left around the corner. Nyet Entry To Gourmanoff Russian Grocery indeed.